When I first started writing this blog a few years back, I wasn't as organized with how I would present photos and information as I am now, nor did I really imagine that the blog would get as much attention as it has. I planned on posting photos quite often but hadn't really considered that the content would often be just as important to people visiting the blog as the photos were. To that effect I made a few posts that combined locations and didn't really provide the information that certain places actually deserved. This was the case when I posted about Taipei's Confucius Temple (台北孔廟) as well as its neighbour Bao-An Temple (保安宮) which happen to be two of Taipei's most important places of worship and also travel destinations for tourists. My plan is to rectify that by giving each location the proper respect and making separate blog posts using both new and old photos as well as giving more detailed information. Taipei's Confucius Temple (台北孔廟) located in the city's Da-Tong district (大同區) is a popular tourist attraction in Taipei and is an excellent example of southern Fujianese architecture. The temple is open year round to tourists with a full time tourism bureau kiosk inside the gates offering guided tours to visitors and it also acts as a Chinese cultural centre holding free Chinese calligraphy lessons as well as other classes that bridge the gap between China and Taiwan as well as the west. The temples are known throughout Asia as "Temples of Literature" but it's important to not confuse them with temples dedicated to the Wenchang King (文昌大帝) who is otherwise known in Taoism as the "god of literature". The difference between the two is that while there are various religious celebrations dedicated to the Taoist God and during exam times students will visit to pray for good grades, that doesn't actually happen at a Confucius temple as they're set up more to promote education and venerate an individual who is thought to be the greatest teacher who ever lived. The simplicity of the temple may make the average tourist think that it pales in comparison to its much larger and more spectacular neighbour Bao-An temple (or any other Taoist temple for that matter), but that is really not the point of a Confucius temple - They are set up to seem like an ancient school and while inside may seem like a library but there is certainly a lot to notice when you're there. There are of course various Confucius temples found throughout Taiwan and while the Taipei temple was not the first to be constructed (Tainan's Confucius temple was the first in Taiwan built in 1665) nor is the the most beautiful (Taoyuan's is the most beautiful in my opinion) but the temple does have an interesting history and that history relates to the modern development of Taiwan through the Qing Dynasty, the Japanese Colonial era and the most recent Republic of China period of Taiwan's history. The Taipei temple's origins date back to the Qing Dynasty (清朝) when the empire established a proper base of operations in Taipei years after the defeat of the descendents of Koxinga (鄭成功) and his clan of Ming-loyalists (who occupied parts of Taiwan and were considered a major annoyance to the newly formed empire) and started to develop the city. History has shown that for the majority of time that the Qing controlled Taiwan they were mostly uninterested in the island referring to it as a "ball of mud beyond the sea" which added "nothing to the breadth of China" (海外泥丸，不足為中國加廣) and were ultimately unable to expand their land control any further than the western coastal strip due to disinterest and the fact that Taiwan's Indigenous groups (who had lived on the island for tens of thousands of years) weren't exactly interested in making friends with strangers. This fact is important to remember when you hear about Chinese claims of sovereignty over the island as the Qing couldn't even come close to controlling the entire island the way the Japanese did. In 1875, almost two hundred years after the Qing took partial control of the island they established "Taipei prefecture" and almost immediately set in motion plans to construct a Confucius temple to serve the literati, matters of the court and impose imperial culture on the people of the island. Construction work on the temple began in 1879 with parts being finished in 1881 and the rest reaching completion in 1884. 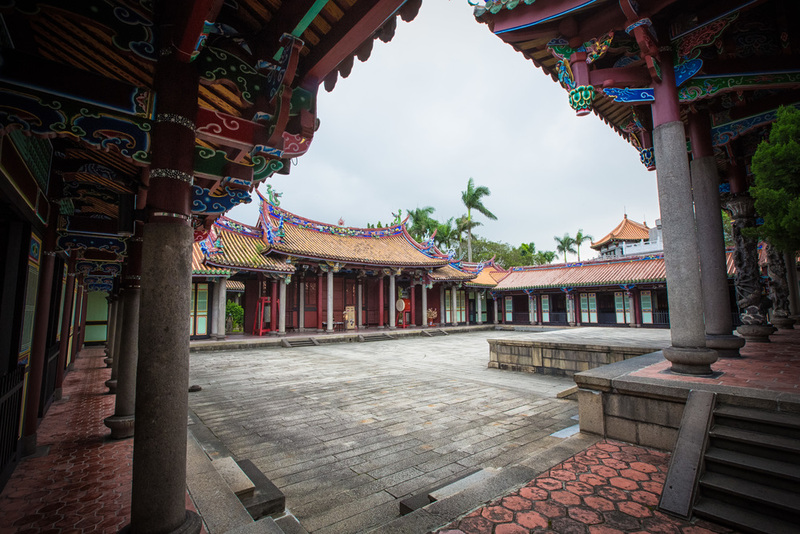 The location of the temple was different than today and is actually on a site near Taiwan's presidential palace in the governing district of the capital. The lifespan of the original temple was cut short due to the breakout of the first Sino-Japanese War (甲午戰爭) and the ultimate signing of the Treaty of Shimonoseki (馬關條約) which ceded control of Taiwan and the Penghu islands to the Japanese empire. When Japan took control of Taiwan they quickly moved to quell any sort of resistance and also put much more effort into achieving complete control of the island than the Qing did. Taipei being a major economic centre for the Qing meant that the population of the city was likely very loyal to the empire and uprisings were often held forcing the Japanese to strong arm the population and institute new policies that would promote Japanese culture and language. In 1907 the original temple was torn down and replaced with the Taipei First Girls School (臺北市立第一女子高級中學) causing most of the ceremonial objects and tablets within to be destroyed or disappear. This is where the story gets interesting however - The harsh policies implemented by Japan didn't last that long and when the situation cooled down, life in Taiwan wasn't actually that bad. The Japanese brought with them modern education and helped to develop the island making life here more bearable and coincidentally more efficient - something which continues to this day. When those policies were eased up a group of people including several Japanese members of society formed an organization which aimed to collect support and more importantly donations for the construction of a new temple. Land owners in the area ultimately donated over 180,000 square feet of land for the temple in Daodaocheng (大稻埕) which meant that the next step was to find an architect to construct the temple. This was an issue for the people in Taipei because no one actually had any skill or experience building an actual Confucius Temple. The history lesson up to now might have been a bit boring but for me this is the part that gets interesting - The organization that was tasked with construction of a new temple now had the land and the funds necessary to build a temple, but they needed someone with the building and design expertise to bring it all to fruition. They contacted a well-known builder from Fujian province named Wang Yi-Shun (王益順) who was well-known in Taiwan at the time for his masterpiece of renovation work which he had completed on the Mengjia Longshan Temple (艋舺龍山寺) as well as on the Hsinchu City God Temple (新竹城隍廟) - giving him a resume like no other! The organization contacted him shortly after he completed work on the City God Temple and he agreed to their terms becoming the chief engineer in charge of both design and construction of the new temple. Wang is still considered one of the best carpenters of the late Qing dynasty and has a reputation for creating a fusion of the most important characteristics of Southern Chinese and Fujian-style architecture with that of traditional northern Chinese buildings like that of the original Confucius temple in Qufu. Due to Wang's influence the newly constructed temple became the only Confucius temple in Taiwan (of which there are many) which was designed with Fujian-style adornments while still finding its inspiration from the original Qufu Confucius temple (山東曲阜孔廟) in China's Shandong Province. Purists may argue that liberties were taken with such a fusion of styles but I think it's important to remember that the blending of styles allowed for some familiarity and more appreciation of the temple as the majority of Taiwan's earliest immigrants came from Fujian province and were not well well-versed in Northern-Chinese architecture. Construction on the temple commenced in 1927 and on September 28th 1930, Teacher's Day (Confucius' birthday) was celebrated in Taipei for the first time in decades. At the time of the celebration the temple was only partially completed, however Wang Yi-Shun returned to China where he died shortly after at the age of 70. After Wang's death, further additions were ultimately added to the temple complex which were completed in 1939. Shortly after completion the Second World War broke out and the Japanese ended the period of relative harmony as the nation prepared for war and because of this, Chinese cultural ceremonies were banned meaning that the Confucius temple was about to enter another difficult period. After Japan surrendered to the allies, they were forced to relinquish control of Taiwan to the newly formed Republic of China which was led by the Chinese Nationalist Party (中國國民黨). The government quickly set up shop in Taiwan shortly and was ultimately forced to fully retreat to Taiwan with millions of people when they lost the Chinese Civil War in 1949. In 1950 on the occasion of the 2500th birthday of Confucius, President Chiang Kai-Shek (蔣中正) visited the temple and gifted it with a large plaque with his personal calligraphy - The plaque read "Education for All" (有教無類) and the temple thus entered the modern period where it was gifted to the Taipei City Government in order to ensure that education and Confucian philosophy should be a priority for the nation. One of the common features of all Confucius temples is that there is no imagery or statues of Confucius. This is a rule that goes back almost 500 years to the Ming Dynasty (明朝) when the emperor decreed that all Confucius temples should be uniform and only have "spirit tablets" (神位) rather than images of the sage. This practice has endured in Confucius temples up until today but if you really want to see the guy you don't have to go far as the neighbouring Bao-An temple has a shrine set up to the sage. Dacheng Hall is the main shrine area of any Confucius temple. The hall sits in the middle of a large granite courtyard with a large elevated platform in front of it as well as on the sides. Inside the hall is a very simple set up with the Confucius spirit tablet set up on a nice red table with an "Education for all" (有教無類) plaque above it. The phrase was taken from the Analects of Confucius (論語) and was written in calligraphy by none other than the glorious dictator Chiang Kai-Shek himself. 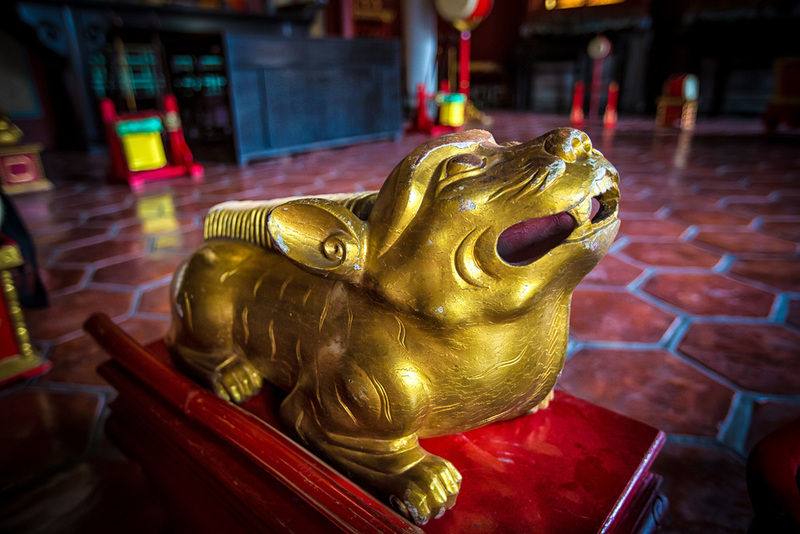 The simplicity of the shrine room is a stark contrast to what you'd see at a Taoist temple but there is beauty in simplicity and if you have the chance to walk inside the shrine room (it's not always open to the public) I recommend stepping in and checking it out. There are an additional two shrines in the room found upon the west and east side walls and are dedicated to the four sages (四配) Yan Hui (顏子), Zengzi (曾子), Zisi (子思) and Mencius (孟子) who were Confucius scholars and authored books which improved upon the philosophy. The key things to notice in the hall would be the spirit tablets but also the 'seven-levelled' pagoda in the middle of the roof which is thought to suppress evil. There are also 72 clay owls under the pagoda. You should also check out the 42 large pillars inside the shrine room and on the outside as well. The wooden trusses below the roof are also painted in the southern Fujian style so it sets the hall apart from others in Taiwan and China. The Lingxing Gate acts as the main entrance to the temple. It's a necessary part of any Confucius temple yet the main gate at the Taipei temple is unlike any other and is where the architect and designer Wang Yi-Shun had the most influence. 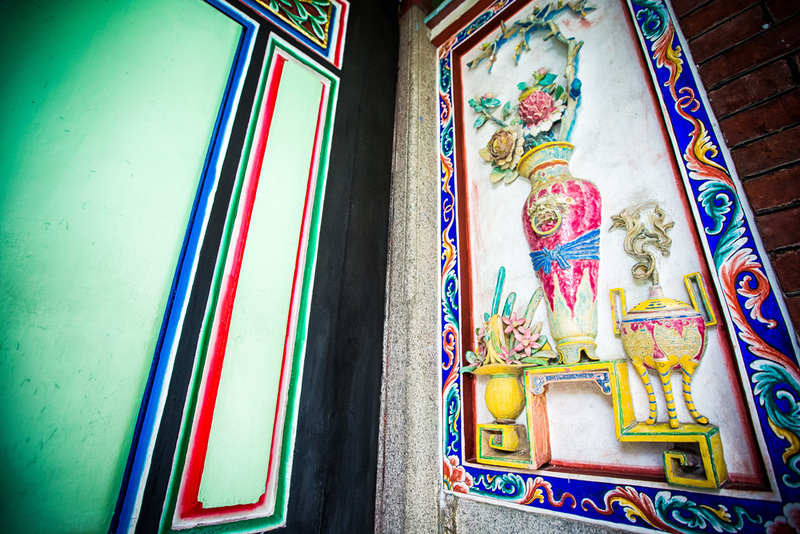 The gate is decorated with beautiful ceramic murals on the sides featuring bird and flower patterns as well as different events in the life of Confucius. The ceramics are part of the reason why this temple has set itself apart from the rest and shouldn't be missed. The gate acts like a park and there is a lot of greenery in and around the gate. It is a popular hangout for local senior citizens who want to come and have a chat with friends or have some peace and quiet from city life. One interesting thing to note however is that Wang Yi-Shun passed away before the gate was completed so if you have a sharp eye you may notice subtle differences in the wood work around the gate. The Chongsheng Shrine is situated behind the main Dacheng Hall and is used as a shrine room to venerate several generations of the ancestors of Confucius as well as the various Confucian sages and philosophers throughout history. This shrine room is not unlike a shrine room that you'd find in any large Taiwanese home and is an important place for ancestral worship. The descendants of Confucius have spread out throughout China, Taiwan and Korea so it's important for them to have a place to worship. The shrine room isn't often open to visitors but you can look through the windows to see inside and if it is open you can walk in and see a smaller shrine room that is quite similar to the much larger shrine in Dacheng Hall. 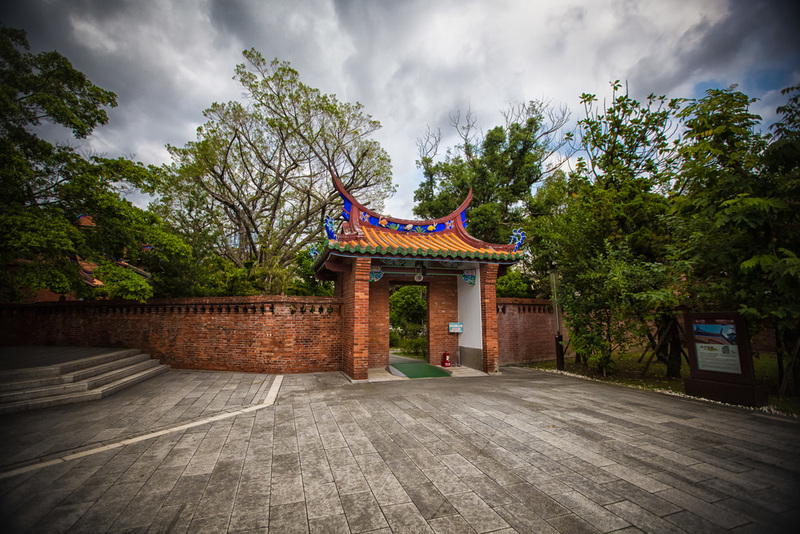 The Taipei Confucius temple is generally not a very busy temple, but it is a well-known tourist attraction in close proximity to an MRT station. There are sparse groups of visitors throughout the day and the temple really only experiences massive crowds of people on Teacher's Day (September 28th). If you are in Taipei at that time and want to experience an ancient tradition that venerates China's most important sage you will have to wake up early as the ceremony starts at 6am and is often attended by mayors and presidents alike. 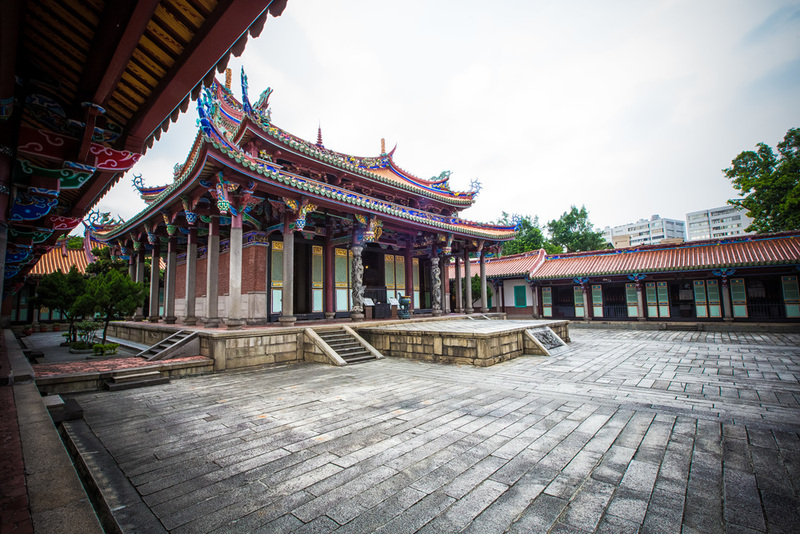 The temple is a short walk from Yuanshan station (圓山捷運站) on the red line of the Taipei MRT. There are signs that lead tourists in the direction of the temple and it is quite easy to find. If you visit, you are free to enjoy the temple and the park next to it - There is a tourist information bureau just outside the temple that will provide information about the temple in several different languages. I realize that this was a long post, but I thought the temple deserved a much better effort on my part and hope that the detail in this blog, which I spent quite a bit of time translating from Chinese helps people to better understand the temple and how unique it is - something I didn't actually realize before doing all of this research!